Katsumi Tamura's whimsical animal calendar. JUNGLE LOVE: Who says a calendar has to be flat and hang on a wall? This whimsical confection from Katsumi Tamura is a kit involving six different animals cut from stiff white paper, each with a month of the year printed on each side. 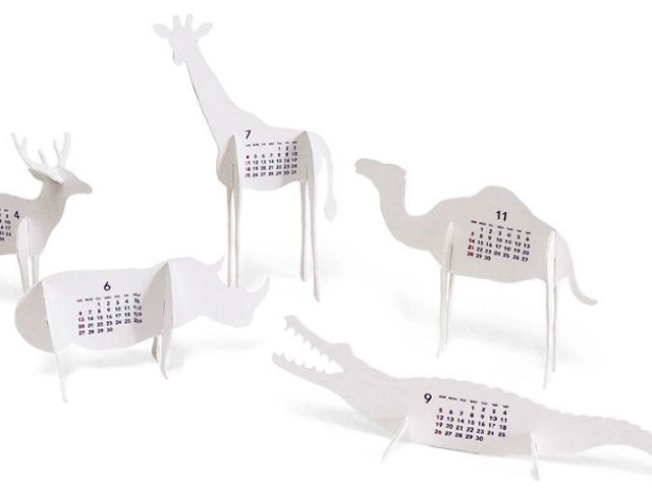 Kids will enjoy popping them out and standing them up -- adults will dig the calendar-as-art installation conceit. The 2010 Animal Calendar is $24.95 at the MoMA Store, 81 Spring Street, 212-613-1367. PLAYFUL: Fall’s Tribal Collection from New York-based handbag-and-more designer Agathe Planchon’s Gustto label is a study in contrasts: We especially like that of the rugged croco-print leather vs. the sweet, corset-like criss-crossing ribbons. Starting at $360. The collection is available as of September 15; pre-order now. DOPPELGANGER: The "Daily Aesthetics" collection at Abitare is full of cheeky takes on supermarket food packaging – like this cute creamer, where smooth white porcelain stands in for waxy cardboard. $19 at Abitare, 309 Henry Street; 718-797-3555.